I’m looking forward to to our holiday in a few weeks. 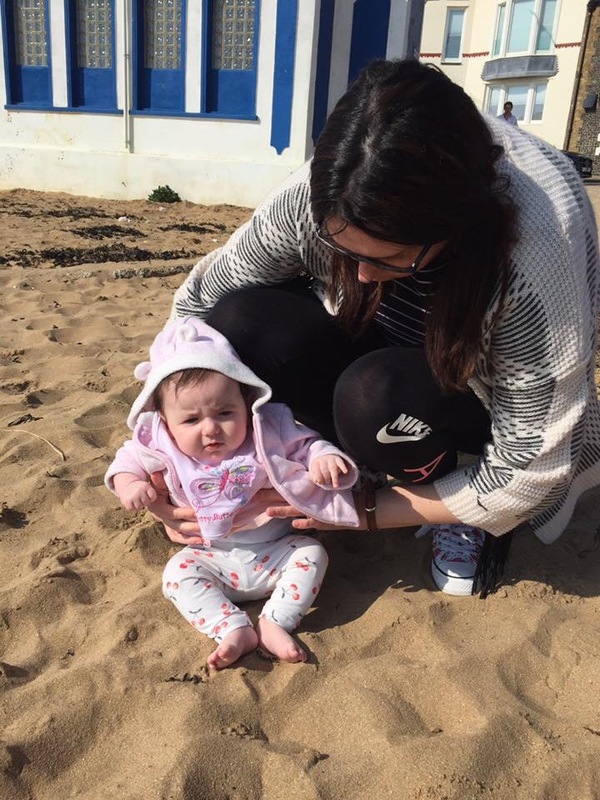 Back in March Emily felt the sand in her toes at Broadstairs beach for the first time. She was a little unsure at first, but after a few taps, snuggling her toes deeper in the squishy sand, she liked it. Now that summer is here, I thought we’d be spending more time down at the beach but with the weather so all over the place, I’ve not taken Emily down to Ramsgate beach yet. And the fact that she’s not a huge fan of the sun, maybe that’s been a factor too. Growing up in Isleworth I didn’t have a beach close to me. We’d only get to go to the beach when we went for a family day out to Brighton or went over to a Ireland to visit my grandparents. Here, Emily has the best of both worlds, plenty of big spacious parks and the beach a 15 minute walk up the road. She’s not very interested in the sun and lots of people, so I’ll wait till next year for beach dates with family and friends. In just a few weeks, Sam, Emily and I will be holidaying it up in Pueblo Indalo, Mojacar for a week and we can’t wait. It’s the first holiday for Sam and I as a couple and all three of us together as a family. Emily will get to swim about, well, splash in the pool, we all go out for dinner, go to the beach, see Emily react as her feet squish into the sand. If anyone deserves a holiday, it’s us three. In the past few weeks we’ve all been really frustrated. Work, parenthood, trying to crawl/walk. It’s the fun games of every first year of parenthood and babys frst everything. We had booked and paid off our holiday months ago but our thoughts and planning the little details were important because although a hot summery country is a desire, we weren’t booking just for Sam and I, we were booking for Emily and we needed to make sure she’d be comfortable wherever we’d go. We set our sights on South Spain, Majacar, at a gorgeous all-inclusive resort for 7 days. We managed to get a great deal for an apartment in a complex that had everything a family would need for their holiday – pools, restaurants, entertainment, not far from the town or beach. Our apartment has a balcony so once Emily is down for the night, Sam and I could have a drink on the balcony overlooking our resort. Nice and chilled. As it’s all inclusive, we’re not throwing money in the wind. With older children, a half board or self catering is more appealing as you can go off with your hired vechicle and take a packed lunch, with us, all inclusive works. We have everything we need in one place. We have a comfortable base to stay in as that’s probably where we’ll spend most of our time, with maybe an eve trip out for dinner in town or one afternoon at the beach. We took som advice from our travel agent to bring a few essentials for Emily and for safety reasons, it makes sense. Whilst Emily starts to move around a little more, we’ll still have the buggy with us (I bought a foldable one online), a sun tent and plenty of toiletries not only for us adults by for Emily too. All the essentials, for all those just-in-cases! We’re going in September so hopefully the sun won’t be as hot, so Emily will enjoy it more. Sam and Emily have pale skin. She definitely didn’t get my skin! So hopefully th September sun will be less empowering on us all. Previous Post Parents and Volume Control, when do you step in?